Having a storefront or online retail business requires a decent amount of working capital to keep operations running smoothly. Without having proper inventory, equipment, employees, premises and products is essential to having a thriving retail business. But with the nature of the business cycle for storefront and online retailers, there are times when you go through dips in cash-flow leaving you in a situation where you may find yourself at risk of not being able to pay essential business operation bills, and even employee payroll. Other times you may find yourself needing to make emergency repairs that requires the need to obtain a capital injection. And then there are times when a small retail business may find itself facing a growth opportunity that would require upfront cash that will bring great returns. When a retailer finds itself needing funding for any of these needs, chances are they won’t be able to secure financing for these needs through a bank, because these business uses are generally much less than the minimum amount conventional lenders are willing to lend. When a retailer finds itself needing fast funding without the hassles they’d receive with a bank, an option would be to get a retail store cash advance. What is a Retail Cash Advance? Lets first start by saying what a retail merchant cash advance is not. A merchant cash advance (sometimes referred to as a business cash advance) is not a business loan. A cash advance is actually the sale of some of the retail stores future business revenues in exchange for upfront funding. So in actuality, a cash advance is simply a way to get paid early for business revenue that is expected in the months to come. In exchange for the upfront financing the small business agrees to sell the future revenues at a discount. Therefore, they will not be receiving a full advance amount for the receivables being sold. The will instead receive between 70-90% of the receivables value. How Does a Retail Cash Advance Work? When a retailer is seeking a cash advance, they will submit a basic credit application along with recent business bank statements as well as their merchant credit card processing statements to the funder for analysis. Review of the documents generally happens fairly quickly, with most underwriters completing review within a couple of hours. After completion of review, the funding company will decide whether or not to provide an offer to the merchant. If the merchant is provided an offer, the offer entails funding amount, rates, terms and type of repayment. Should the merchant agree to accept the offer, the retailer will then be sent contracts from the funding company, along with a list of stipulations needed before funding. Once contracts are completed and the stipulations are provided to the funder, the funding company will then wire funds directly into the retailer’s bank account. The entire process takes a matter of a few days. In some cases, a retail cash advance can even be funded the very same day as when the application was submitted. The beauty of a merchant cash advance for retail businesses is the fact that there are no limitations or covenants relating to uses. A retailer can use a cash advance for a variety of uses including marketing & advertising, purchasing inventory for their storefront or online retail store, paying for emergency expenses (repairs, employee payroll, replace equipment) as well as just about any other working capital use. Now just because a cash advance lender won’t put many (or any) restrictions on how the retail business uses the funds, it wouldn’t make much sense to make long term financing purchases using a cash advance because a merchant advance is short term business financing. Industries That Can Benefit From a Retail Cash Advance? Speed: a retail cash advance can be approved by a funding company within a couple of hours, and can fund within 3-72 hours (depending upon funding company and the amount of financing being sought). Ease: Cash advances require minimal documentation. While a conventional lender will require a few years of tax returns, income statements, balance sheets, accounts receivable and accounts payable aging schedules, debt schedules, etc., a retail cash advance lender simply request an application, bank and merchant statements. Bad Credit OK: retail merchant cash advance funders focus on a business’s cash-flow, and much less on the credit of the business or the business owner. Since cash advances are secured using a repayment plan that comes directly from the retailers business bank account or merchant accounts, the risk is reduced to the lenders. Therefore, cash advances are the perfect type of bad credit business funding. Expensive: a cash advance is much more expensive than bank-rate financing offered by conventional lending institutions. Whereas a convetional lender will offer bank-rates in the single digits, a retail cash advance lenders interest rates are much higher. Short Term: A cash advance isn’t a long-term lending product. Cash advances have maximum terms of between 18-24 months, with a great-majority have terms that are under a year. Many have terms that are less than 6 months, therefore cash advances are among the shortest-term products. Repayments: Cash advances rely on repayments that are not typical of most small business lenders. Where a conventional lender simply requires a small business that has borrowed money to simply mail them a check each month, a cash advance lender will usually require payments be made daily or weekly. Types of Retail Cash Advances? ACH: an ACH retail cash advance relies on repayment coming directly from the borrower’s business bank account each day. After the funder has wired funds to the retailer, the retail lender will then collect repayment by having a set amount deducted and sent to them each business day until the retail cash advance has been repaid. 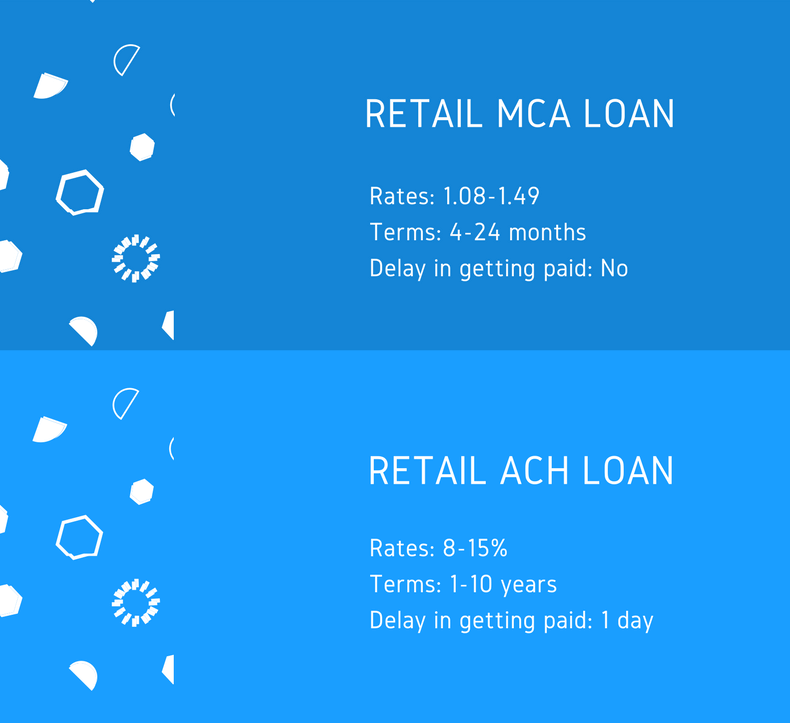 MCA Split: a retail MCA split is similar to an ACH cash advance with the only major difference being the amount that’s repaid daily, as well as the way the payment is made. Unlike an ACH loan, with a MCA split, the repayment is made by having the funder split each day’s credit card transactions. SBA loans: While not an easy form of financing to obtain, a SBA loan is a preferred type of financing for retailers because of the fantastic rates and very long terms offered by the SBA lenders. Asset Based Loans: asset based loans are just a way for businesses to obtain financing by monetizing assets on their balance sheets. When retailers are seeking asset based financing, its generally relating to business or personal property that is collateralized to obtain business financing. Equipment Financing: Equipment financing relates to any way a business uses debt financing to obtain business equipment. Most common form of equipment financing is equipment leasing (where a retailer identifies the equipment they want, and a lender purchases the equipment for the retail store, and then leases it to the retailer for a period of time). Alternative Loans: Midprime retail loans are simply business loans offered by online fintech business lenders. Unlike brick and mortar banks, fintech lenders offer quick financing options without much lower credit and revenue requirements that banks have. Private Loans: a retail store private loan is any loan provided by a non-bank lender (usually offered by an investor – not an institution). Non-bank lenders have lots of ability to have creativity with their lending products because they aren’t restricted by state and federal regulations. 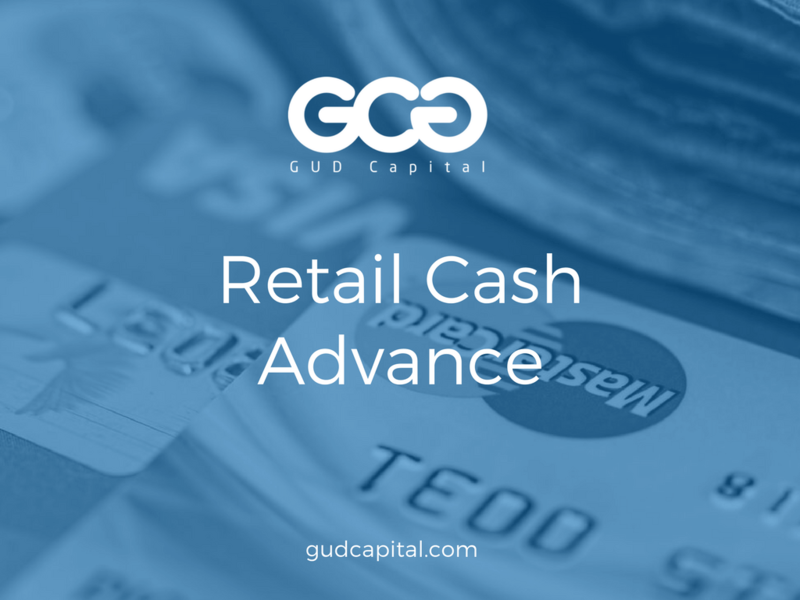 A retail cash advance is a useful product for retail stores that need financing sooner rather than later, and/or find themselves unable to obtain financing though conventional lending sources. Before getting a retail cash advance, a borrower should weigh the importance of funding, and whether the cash advances expensiveness is worth the returns. If you need help navigating the retail store cash advance process, our experts can guide you through the process.